The LS800WU shines bright in virtually any environment with 5,500 ANSI Lumens of high-brightness projection and WUXGA resolution clarity. The projector comes equipped with a laser phosphor technology capable of achieving up to 30,000 hours of maintenance free projection and is capable of 24/7 continuous operation to provide a dramatically durable solution for public use. H/V lens shift and 1.65X optical zoom offers additional flexibility and makes the projectors adaptable to a wide array of installation settings. The projector’s built-in HDBaseT receiver is able to transmit uncompressed high resolution audio and video at a lengthy distance (100 meters for 1080p and 70 meters for 4K/2K) when combined with a cat5e/cat6 cable and is compatible with any certified HDBaseT transmitter. Addition features such as portrait mode and 360-degree projection allow users to deliver a fresh visual perspective for creative applications such as staging and advertising. LS800WU’s built-in HDBaseT receiver is able to transmit uncompressed high resolution audio and video at a lengthy distance (100 meters for 1080p and 70 meters for 4K/2K) when combined with a cat5e/cat6 cable and is compatible with any certified HDBaseT transmitter. 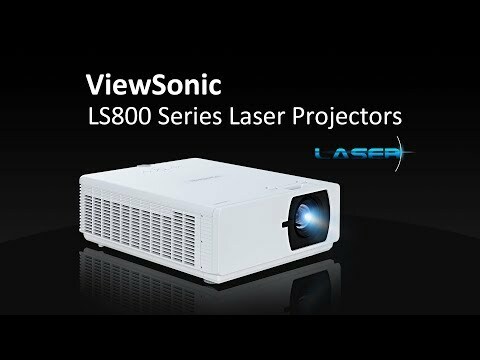 LS800WU is the first ViewSonic projector compatible with Control4 network management. The projector is also Creston, AMX and vController compatible for easy-to-use network management.